Energy conglomerate Reliance Industries and its partner BP plc on Friday said they have made a second deep-water gas condensate discovery in the Cauvery basin, off the east coast. The discovery in the Block CY-DWN-201/2, which lies 62 kilometres from the coast, is being termed as significant as the well has been flowing about 1 million standard cubic metres per day of gas since August 17 when the discovery was made. 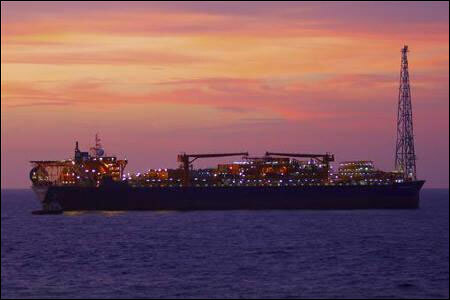 This is the second discovery RIL, which holds 70 per cent interest in the block, has made in the block. It had in 2007 made the Dhirubhai-35 (D-35) gas discovery, which the Oil Ministry's technical advisor, the DGH had termed as not viable at current gas price of $4.2 per million British thermal unit. Well CYIII-D5-S1 was drilled in a water depth of 1,743 meters, to a total depth of 5,731 meters, with the primary objective of exploring Mesozoic-aged reservoirs. "Preliminary evaluation of well data and fluid samples indicated presence of gas condensate in the reservoir interval with a gross column of 143 meters," the two companies said in a press statement. The discovery was name D-56. The block CY-DWN-2001/2 is situated in the Cauvery basin, which is located on the eastern flank of peninsular India, in Tamil Nadu, along the Palk strait and Coromandal coast. According to the companies, the well flowed gas at the rate of 35.2 million standard cubic feet per day (1 mmscmd) with condensate at the rate of 413 barrels per day. BP holds 30 per cent stake in the block. RIL had drilled the first discovery well D-35 in July 2007 and a subsequent well to appraise the find in September 2009. Three other wells on the block were dry. The block was won by RIL in the third round of New Exploration Licensing Policy (NELP). The Directorate General of Hydrocarbons (DGH) had in its analysis of D-35 stated that the gas discovery was viable at no less than $6 per mmBtu gas price. D-35 alone can produce 150 million standard cubic feet per day of gas (a little less than 5 mmscmd) for 10 years from five development wells on the find. First gas is envisaged in four years. The discovery, according to the operator, holds 719 billion cubic feet of gas reserves, of which 62 per cent or 447 bcf can be recovered. Besides gas, the find also holds a small amount of oil - about 11 million barrels. Sources said RIL had proposed a capex of $1.452 billion in development of the find and another $267 million of exploration expenditure. DGH, however, believes the find holds 622.3 bcf of inplace resources, of which 378.56 bcf can be produced. RIL-BP said the preliminary evaluation of well data and fluid samples indicated the well intersected a gross hydrocarbon column of 143 meters in the reservoir interval. A drill stem test was carried out and the well flowed at a rate of 35.2 million cubic feet of gas per day and 413 barrels per day of condensate, on a 20.6 millimetre choke. The Government and Directorate General of Hydrocarbons (DGH) have been notified of the discovery, which has been named D-56, they said. This is the second discovery RIL-BP have made since May. In May, the companies had made a "significant gas and condensate discovery" at their Krisha Godavari D6 deep-water block off the Andhra coast. In March, the KGD6-MJ1 probe was drilled in a water depths of 1024 metres to a total depth of 4509 metres. It aimed to explore the prospect of a Mesozoic Synrift Clastic reservoir lying more than 2000 metres below the already producing reservoirs in the D1-D3 gas fields. The well hit a gross gas and condensate column of about 155 metres in Mesezoic reservoirs. Mike Daly, BP's vice president of exploration, commented: "Following the discovery on block KG D6 announced in May, it’s another demonstration of the potential of the resource base that we anticipated when BP entered the original transaction with (Reliance) in 2011."